I am totally ready for my tummy to be back to normal. Thursday at about 4:30 am, I started yakking up uncontrollably. TMI. It sucked. I was also up at that time with baby and didn’t have time to put him down and run to the bathroom. So I held him while I hugged the porcelain god. Thankfully, the hubby woke up and took him from me. It was a miserable day. Water wouldn’t even stay down. I was starving and super thirsty by the time I could finally get a few sips to stay down. It is now Saturday night and I still have very little appetite and the tummy is still twisting ominously. I made Chex mix in hopes that might spark something. It is one of my favorite snacks… But no. The smell totally turns me off right now. And, before you ask, I am not pregnant. I’m actually pretty sure this is food poisoning. Yay! The Ultimate Dryer Buying Experience or Why Best Buy Will Never See Me Again. A few weeks ago our dryer died. Just died. Kaput. Done. Finished. So, we went off in search of a replacement. My mom had given me a few savings bonds she had found stashed away and just asked us to use the money to get a new dryer instead of a used one. So, we went from store to store. Comparing prices and various dryer functions and brands. Ultimately extraordinarily boring and draining. We were done by the time we made it to Best Buy. The prices were all essentially the same at every store on the style I had decided on. It wasn’t anything special. I decided I wanted to have variable temp controls and a dryness sensor was an added bonus. So, we decided to just stop with Best Buy and get the dryer from them. They told us that model would take a few weeks as they had sold out of it during their Labor Day sale. That was fine with us. We had already been hang-drying our laundry for a little over a week and figured a couple more would be ok.
We even splurged part of our credit rating and got the in-store credit card as it gave us a bit of a discount. I was told I just needed to give them a couple of days to get me in the system before I paid it off. So, the purchase and even the credit card all made for a pretty normal sale. I waited four business before I went in and paid most of our balance. I couldn’t remember the actual balance, so paid slightly under. I figured I would finish paying it when I got my statement. The clerk was also unable to look it up for me. He did try, but it came up as a 0 balance. He said I could go ahead and still make a payment and it would be adjusted once the sale showed up on my account. That part was actually the only smooth part of this whole fiasco. About a day after we bought the dryer (maybe two), I received a confirmation email stating my delivery and installation were set for Sept. 29. Cool. That was as I was told. Well, last night (Thursday, September 26th), I checked my email for the first time in a few days and found one from Best Buy that had been sent to me on Tuesday, September 24th. Telling me that my order was back ordered and they had no date as to when it would be available. WTF? So I read it again. Sure enough, they had sent me an email to let me know that my dryer was in some limbo with no idea as to when it would appear. Oh, and if I did not respond to that email, then they would assume I agreed with that action. What if that email had not made it to me? Why wouldn’t they call someone about information like that?? I then told him, “What I need you to do is stop my order and credit my bank account the amount I have already paid on the card, then pay the rest to the card.” He told me he would see what he could do. Then credited the entire amount back to the card. He credited a card I had already almost paid off. Then told me I would just have to wait until the credit card company sent me a check. I pretty much exploded at this time. I argued with him and two other schmucks for 30 minutes. I questioned him why I would have to wait for the credit card company to pay me when they were fully capable of taking the funds directly from my account. I also mentioned that for a store specializing in technology, they were sorely lacking in some technology. Bloody hell, I can refund someone through PayPal in a matter of seconds. The Best Buy credit line is by far the absolutely worst phone experience I have ever had. And I have had jobs that required me to call DMVs, insurance companies, and cell phone providers. The last straw was when I finally reached the actual customer service line only to be told that due to high call volume, they would need me to log onto their website. I said, “Screw this.” Hung up the phone and left the store. Then found a wonderful dryer at Sears (paid cash with what was left in my savings). It is already in my house, hooked up and ready to go. So, maybe all of this happened because I was supposed to find that dryer at Sears. Only, I still feel like I have basically paid Best Buy to take back the dryer I never even saw. 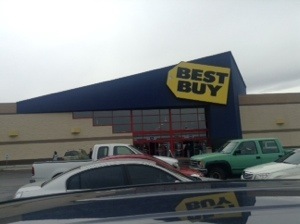 I also found out that Best Buy is failing as a company. Can’t say I am surprised. I don’t know when it started, but I need to stop it. Now. I have gained about 5 lbs since May. I think. I have been too afraid to weigh in. Yes, I have a lot going on in my life. This should not be an excuse to overindulge. I will have some free time tomorrow afternoon, so I will create a weekly menu. I really do very well with my eating habits if I have a list I can follow. It must be a neurotic thing. We still have no answers on what is going on with my baby. He is improving, but is still about 4 months behind on his gross motor skills. And he seems to stay about 4 months behind. We are working to get the insurance to cover genetic testing, but they are really dragging their feet on this test. In the meantime, we have been having just about every other test possible done, with no clear answers. I really think the genetic testing will tell us something. At least let us know if Sammi will require specialized care and therapy for the rest of his life. He had an MRI done last week. I hated that. I was there when they put him under so he would not move during the MRI. I wanted to be there when he woke up, but he was mostly awake when they brought him in to us. He still had his eyes closed, so at least we were the first people he saw. I had a hard time watching them put him to sleep. The MRI results came back as “mostly normal.” Hehe. They found a small cyst near his pituitary gland. This appears to be a relatively common thing and I have been told by a few doctors that it is nothing to worry about now, but to keep an eye on Sammi. If he starts to get headaches, then we may need to take another look at that cyst. I have had 3 moles taken off of my back and am now waiting for the lab results. Cuz I really need more medical crap going on. There. That is my irritable catching-up blog. I haven’t had much time to get on the computer and blog. So, I am just writing a quick update as to how I have been doing. I have finished Week 2 of C25K. I am taking my time with it. I have also been running with a friend who just started the C25K program, so I have been going back and forth between week 2 and week 1. I kind of like that. It really makes Week 1 seem like cake hehe. I have started to think about adding in a 4th run every week that is just a 1 mile run. It is not on the program, so I will have to figure it out on my own. I did a pretty good run today. I was slowed down for a few blocks by a massive cloud of gnats. There were so many I had to cover my nose, mouth, and eyes. It was annoying. I will try to avoid that area in the future. In any case, according to http://www.mapmyrun.com, I ran a total of 2.45 miles. Yay me! That website is a pretty awesome tool. Anyway, that is it for now. I need to get some sleep before I have to get up for a baby feeding.